MagLev or 'Magnetic Levitation' is not a new concept, Germans are testing it for around two decades on their Emsland test facility (they really like to test a lot before doing it), it never hit the mainstream apart from urban MagLev transport system in Shanghai. 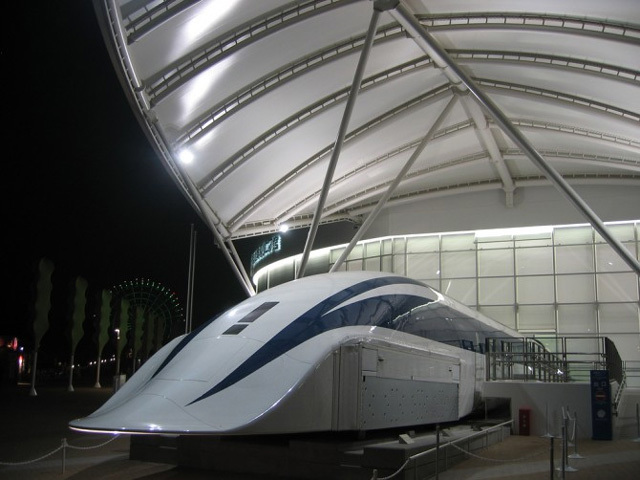 Though now it seems that MagLev trains are about to be the part of our daily life. Japan just tested their latest version of MagLev and its currently the world’s longest and fastest stretch of MagLev train, reaching speeds as high as 310 mph in a demonstration last week. But Japan’s L-Zero only lives on 15 miles of test track, and we’re still more than a decade away from completion. After five years of trials, plus some starts and stops, Central Japan Railway Co. is finally starting construction on a MagLev line between Nagoya and Tokyo, a 177-mile trip that will be cut from 95 minutes on today’s high-speed trains to just 40 minutes with MagLev by 2027. To put that kind of speed in perspective, Amtrak’s Acela takes about 3 hours and 40 minutes to go about 210 miles. A trip from Boston to New York on MagLev would take under an hour. By 2045, JR Central hopes to extend the line to Osaka, which will cut the number of passengers on the frequent flights between the two cities. When built, the MagLev will join an airport line in Shanghai and a low-speed train in Nagoya, among other rail systems that use magnets to float rail cars above a track to reduce friction and increase stability. While Japan’s MagLev promises to be an impressive technical feat, there’s some worry that Japan’s population won’t be big enough to sustain it. The Nagoya extension alone is expected to cost anywhere from $52 billion to as much as $90 billion, thanks to the difficulty of tunneling through cities and mountains to make a straight track. According to Bloomberg, there’s a good chance that the construction will face significant delays. If demographic trends continue, that means Japan’s population may fall low enough to significantly reduce demand for the train once it’s built. Luckily, JR Central is a hugely profitable company with a history of high profits from its current bullet trains. Last fiscal year, the company had a cash flow of $2.95 billion dollars. Along with loans and bonds, that money can easily pay for a major infrastructure project. That kind of confidence was on display as journalists, railway executives and other VIPs rode the test track. Even though it beat a world speed record and accelerated to more than four times highway speed limits, those on board were merely pleased — not necessarily impressed. “Compared with the bullet train, there was a slightly noticeable feeling of speed, it was really smooth.” Transport Minister Akihiro Ohta told Bloomberg.